Although the family didn't attend any tulip time festivities, Cam's godmother certainly did brighten up the h ouse with a fresh bouquet of Holland's finest! Thanks, Jo! The arrival of the IPad at the Weatherford household has peaked the interest of many, including Cam and his friend, Emma. Their favorite activity is "Doodle Buddy" which allows you to draw on the screen with only your fingers! The two friends quickly figured out how to make lots of pic tures, even using "stamps" to show different objects on the screen as well. It seems there are an endless amount of applications to use and it will be fun to discover ot her learning tools that Cameron can use. Since the weekend didn't turn out to be bright and sunny, there were plenty of other things to keep everyone busy. 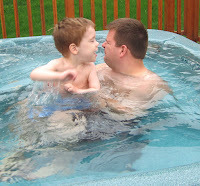 A grocery store run, an outing to the mall fo r lunch and shopping, and then a relaxing time in the hot tub for Cam and Chris. Fathe r and son had a splashing contest and both fared well, although Cameron just enjoyed getting wet! Sunday night games included our weekly gathering with the Raisch family for a delicious dinner and as always, enjoying our fun friendship! !